For Orbital's 1991 debut album, the track listing for the US edition was different from the running order released in their native land England. For their fourth album In Sides, most copies came with a bonus disc. Depending on where in the world you lived, the contents of that bonus disc differed. Their sixth album The Altogether was a double. Now that brothers Phil and Paul Hartnoll have reunited for the second time, the electronic music duo known as Orbital once again have more material than they know what to do with for their new album Monsters Exist. Fans who pick up the deluxe edition are treated to a grand total of 17 tracks spanning 84 minutes of new material, provided they don't remind two reprise appearances in the form of one instrumental mix and one remix. 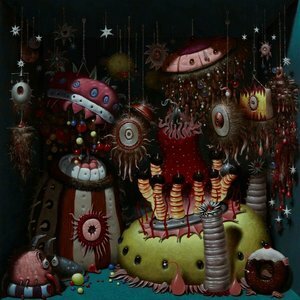 But even if you can't get your hands on this limited edition, a single disc copy of Monsters Exist still rewards you with a bewilderingly unique album, one that manages to perk your ears in the same ways that their earlier albums did. Seriously, if you thought that 2012's reunion Wonky was a little on the underwhelming side, you would be doing yourself a favor by picking up Monsters Exist. The cover art is a big tip-off that you're about to get yourself into something strange. John Greenwood's surreal cartoon work bears a resemblance to Jim Woodring's work viewed through an extra nightmare filter. The title track, which starts the album, goes the extra terrifying mile in convincing you that, yes, monsters do exist. As a harmless keyboard couplet rolls around and around in the treble clef, a series of ominous tones are stabbed out at the opposite end. They are too melodramatic for any "serious" IDM but are also too scary for any light listening. As the song gathers some mid-tempo steam, these troubling tones are joined by orchestral hits that just can't be listening to while alone at night. Any softer tones thrown in to simulate melody are overpowered by the doom this bass sound continues to bring, and it's a tremendous thing to hear from a band that is, according to some, 25 years removed from their artistic peak. For "Hoo Hoo Ha Ha", you've finally entered the dance club, but something still isn't right. It's as if the Joker did the interior decorating and the maniacal laughter of its chirping synthesizers is destined to follow you forever. Even the main melody sounds bent and broken, at the mercy of a playful pitch-bender. "P.H.U.K." is playful and chipper, but don't count on that settling into a constant mood when it is punctured by melancholy passages and preceded by a track containing a sample that proclaims with a shout that the world "is poison!" "Tiny Foldable Cities" sounds like one of the cables connecting the synthesizer to the speakers kept shorting out, the bottom end of "Buried Deep Within" returns us to the aesthetic of the title track, and "There Will Come a Time" features British physicist Brian Cox waxing philosophical about how everything in the universe will die one day: "In the far future, there will come a time when time has no meaning as the universe expands and fades. Our descendants, isolated on an island adrift in an ocean of dark, will watch as the galaxy evaporates away. How does that make you feel?" Orbital's seven-minute soundtrack to this Cosmos-lite episode is appropriately amorphous and haunting. But I still can't detect the significance in a sentence like "Meaning is not eternal, and yet meaningness exists today because the universe means something to us!" The last "us" is punctuated by multiple voices chiming in at once as if that were to clarify everything. If you find this to be too heavy-handed or corny for your techno needs, there is an instrumental mix on the bonus disc. Kareful's remix of "Tiny Foldable Cities" gives the track a more relaxed feeling while managing to keep its sense of mystery intact. As for the other six selections, they are more light and frivolous in nature in comparison to the parent album. "Kaiju" is just some fun '90s-era EDM, "A Long Way From Home" is a 90-second lullaby performed on a classical guitar, and "Analogue Test Oct 16" sits somewhere between synth noodling and synthpop. Things start to get skewed on "Fun With the System" in a manner not unlike "Hoo Hoo Ha Ha", though it does so without all the menace. Orbital tackle that lovely paradox known as ambient techno of "Dressing Up in Other People's Clothes" and whip up something that sounds like a soundtrack to a blindingly dizzying light show on "To Dream Again". Just a cursory listen to the 34-minute bonus disc makes it crystal clear why these selections were omitted from Monsters Exist. With just nine tracks, Orbital once again prove that their chosen genre of music need not be so devoid of emotion or variety, and why they, despite the time off, continue to remain at the top of a heap heavily populated with copycats. Given that they've disbanded twice, we can't be certain about anything in the Hartnoll brothers' future. But with an album like Monsters Exist, their legacy remains securely locked into place.